with their very own entry/float. 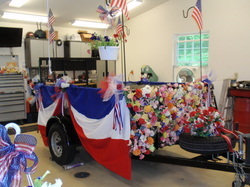 They work together in designing and preparing the entry, then members either ride or walk the parade route promoting the Garden Club. Packets of flower seeds are distributed to the viewing public.